Vegan diets are a challenge for a baker. Eliminating eggs and dairy products might sound easy, but when it comes to texture and taste, let’s just say we’re not sold yet. Sure you can make a pretty good carrot cake using tofu, as Tartine bakery has, but we draw the line at using fake butter and soymilk. These products have no place in baking, at least in our kitchen. Then there’s the egg dilemma. We know there’s the trick of using 1-tablespoon ground flax seed to 3-tablespoons of water to substitute an egg in a pinch, but to eliminate all the eggs in a recipe with ground flax seed would be like eating a handful of sand. Bleh! Why can’t there be a rich and delicious pastry with some healthful benefits added without tasting like saw dust? And it doesn’t matter if a vegan pastry is free of animal products, sometimes they’re even less healthy than the traditional pastry. At the same time, no one needs a high caloric, sugar loaded, coma-inducing muffin first thing in the morning. Here’s our option for a more balanced–not vegan–muffin. Jason took inspiration from a few of our favorite bakers/cooks, Martha Stewart, 101 Cookbooks, and Kim Boyce’s Good to the Grain and came up with a tasty muffin that’s good in the morning and at night. To eliminate the butter in traditional muffins he added olive oil, which gives the muffins a nice flavor, plus all those Omega-3’s everyone talks about. A couple ripe bananas substitute for one of the eggs (no flax seed in this recipe), but this recipe still calls for two eggs, sorry veganeers (Is that the term for militant vegans?). The banana adds a bit of sweetness too without overpowering the muffins with a strong banana flavor. Replacing some of the all-purpose flour with whole spelt flour not only adds a nutritional punch, it’s also a nice compliment to the olive oil. And, adding cooked quinoa to the muffin batter and the streusel mix adds texture, flavor, and increases the protein significantly. The dark chocolate, while delicious in just about anything, has so many health benefits that everyone should eat a little every day, we do. Calling these muffins healthy is just an added benefit. Personally, we just call them delicious. Enjoy! Health, health, health, darling! 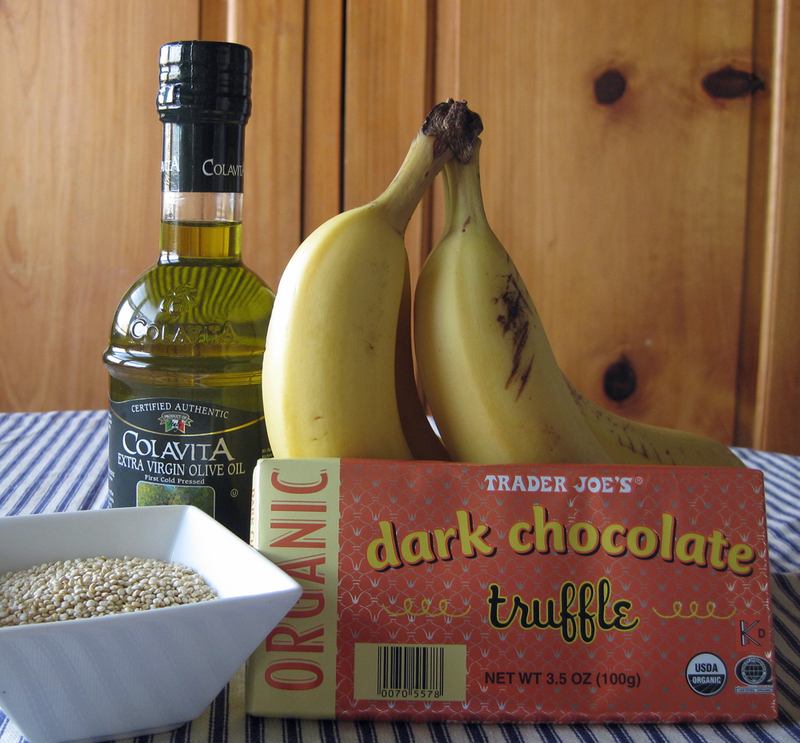 Quinoa, olive oil, bananas, and dark chocolate. In a small bowl, mix together the whole spelt flour, cooked quinoa, brown sugar and salt until combined. Add the olive oil and mix until blended. Set aside. Preheat oven to 350 degrees. With a little olive oil on a paper towel, grease seven spots on each of two, one-dozen muffin tins for a total of fourteen muffins. Be sure to leave ungreased muffin spots between the greased muffin spots to allow air to hit most sides of each muffin. In a large bowl, mix together the all-purpose flour, whole spelt flour, brown sugar, cooked quinoa, baking powder, and kosher salt until thoroughly combined and there are no brown sugar lumps, then add the dark chocolate. In a separate bowl mash the bananas with a fork until thoroughly “mushed.” Add the yogurt, olive oil, and eggs, and whisk together. Add the wet mixture to the dry mixture and gently stir together just until all the dry ingredients are thoroughly blended with the wet ingredients. Do not over mix. Using an ice cream scoop, fill each muffin tin until almost full. 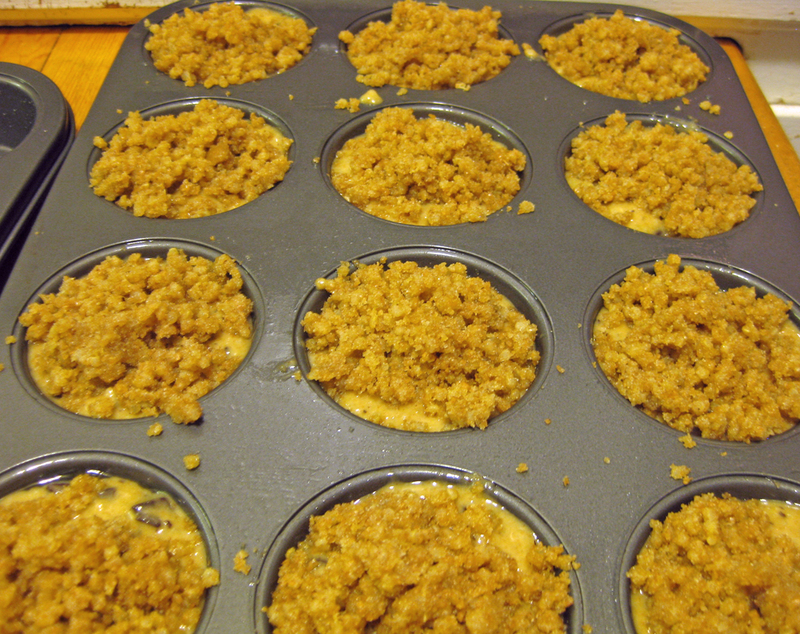 Distribute the crumb topping evenly over each muffin. Bake for about 25 minutes rotating the pans mid way through baking. Remove the muffins from the oven and cool for 5 minutes in the pan then remove the muffins from the tins and allow to cool on a baking rack for about 20 minutes, if you can resist the temptation. What’s up with 14 muffins? *If you are unable to find whole spelt flour, you can substitute regular whole wheat flour, graham flour, or just use 1 ¾ cups all-purpose flour for the muffin recipe plus ½ cup all-purpose flour for the crumb topping. **To cook quinoa, in a medium saucepan add 1 cup rinsed quinoa, 1 1/2 cups water, and a pinch of salt. Bring to a simmer and cook for 15 minutes, or until the water has absorbed. Allow to cool before making the muffins. Reserve any leftover quinoa for another use. Where are the holiday cookies? At this time of year, we’re usually baking cookies and making confections to give out to our family and friends. We scour our cookbooks for weeks, spend hours shopping for the perfect container to put them in, then more hours baking, and more hours packing them up for shipment, only to have them reach their destinations where they sit on the counter along with all the other baked gifts from everyone else. Instead of contributing to the waistlines and blood sugar levels of our family, this year we decided not to give out baked goods. But, with the holidays right on top of us we know we need to write at least one post about holiday cookies. We’ve decided to showcase a recipes that really isn’t a traditional holiday cookie – yet. With the addition of whole rolled grains and whole flours, these cookies might become a favorite to add to your collection next year. The recipe is one Jason created a few years back, and one that has been recently influenced by Kim Boyce’s Good to the Grain cookbook, with a whole grain philosophy, making it a little more unique. Typically made with 100 % rolled oats and all-purpose flour, Jason’s Cranberry Pecan cookies are earthier and chewier with a mixture of rolled whole grains along with a cup of oats and a flour ratio of one part Kamut flour to two parts all-purpose flour. The flavors of tart cranberries, toasted pecans and fresh orange zest make these cookies a real favorite year round. Of course, if you don’t have Kamut flour and multigrain cereal you can use rolled oats and all-purpose flour for the recipe. While our families won’t be getting cookies this year, we have made a few batches in preparation for Santa’s imminent visit. On Christmas Eve, Santa will be greeted by a big plate of Cranberry Pecan cookies and a good-sized shot of Dalwhinnie to warm him up. And why not? Santa has a team of designated drivers to keep him on course through the night. He’s getting plenty of whole grain fiber in the cookies, which he obviously needs. We say let him enjoy a little nip before heading back out into the chilly night, belly full and cheeks aglow. Preheat oven to 350 degrees. Cream brown sugar, 1 1/3 cups sugar, salt, and butter until well cream, about 4 minutes. Add the applesauce and zest allow to incorporate. Add eggs and vanilla then continue to mix until eggs are blended. If the mixture looks a little broken, don’t worry the cookies will still work out. In a medium bowl mix together the oats, multigrain cereal, pecans and dried cranberries. In a separate bowl mix together the kamut and all-purpose flours and baking soda. Add the oat mixture to the creamed sugar then slowly add the flour. Mix just until no flour is present. Using a small ice cream scoop, scoop the cookies onto Silpat mat or parchment paper, spacing so that the cookies don’t touch during backing. Put the ¼ cup sugar on a small plate. Wet the bottom of a thick, flat bottomed glass and place the glass bottom on the sugar. Press down on the tops of each cookie, placing the glass back in the sugar after each press of a cookie. Bake for 10-12 minutes depending on the size of the cookies. The cookies may be a little crispy at first but will soften after a day or two in a cookie container.